We’re excited to announce a new fundraising effort with 3 Dog Pet Supply. 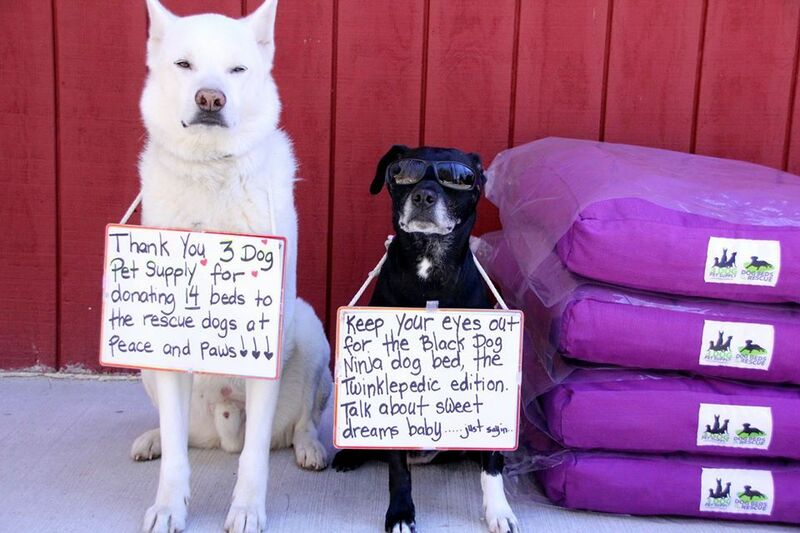 For every dog bed purchased, Peace and Paws gets one bed for the dogs at The Ruff House Retreat. This means so much to us and the dogs. 3 Dog Pet Supply’s mission is to improve your dog’s life with superior dog products, and to improve the lives of rescue dogs around the country with its Dog Beds to the Rescue campaign. This activity is designed to provide countless new dog beds to deserving shelters around the United States. The beds will provide an immediate need for us here at Peace and Paws, and more importantly, will provide a comfortable place for the dogs to snooze. We love partnering with companies like 3 Dog Pet Supply because they are a family-owned, rescue-friendly business trying to make a difference for the dogs. The dog beds are made in America, too!